Garages and garage doors protect some of the most valuable assets owned by our clients’ luxury properties and estates and it is essential that they are secured to the correct level of security. If you are a collector of expensive vehicles, antique or elite cars or antique goods, then it’s of paramount importance that you ensure you have high security garage doors as protection for these possessions. When incorporated into the main property, or part of another entrance/exit to the property, it is crucial that the garage door security at the very least matches the security of the main property. This can only be properly executed with a high security residential garage door. Why is a High Security Garage Door important for Prime Residential Homes? Unfortunately, garage security is often reduced in favour of aesthetics, and the link to the main property is not sufficiently secured in lieu. Likewise, standalone garages are often incorrectly treated at a separate security level to the main property. This is clearly an issue, as out-houses and garages are more vulnerable to attack due to their relative isolation. and also often contain high-value vehicles or leisure equipment. For this reason, it is important to have independently certified security products on the garage to mitigate against attack. The Equilux High Security Garage Door has been specifically designed for this purpose, and intelligently combines aesthetics with security, meaning neither has to be compromised. Equilux high security garage doors are designed to complement the design of luxury properties whilst still providing the necessary security requirements. Independently tested and certified by the Loss Prevention Certification Board (LPCB) all Equilux garage doors are security rated to LPS 1175, Issue 7, SR2 and Secured by Design as standard, with higher security ratings and bespoke resistance available. The SR2 security rating is designed to resist a determined attack by an opportunist using bodily physical force and tools with a high mechanical advantage and is suitable for most high-risk domestic applications. The SR3 security rating is designed to resist more experienced attackers and with a wider range of hand and power tools. Incorporating the LockDown security system, our garage door cannot be lifted by force yet does not require any form of secondary locking, ensuring ease of user operation. 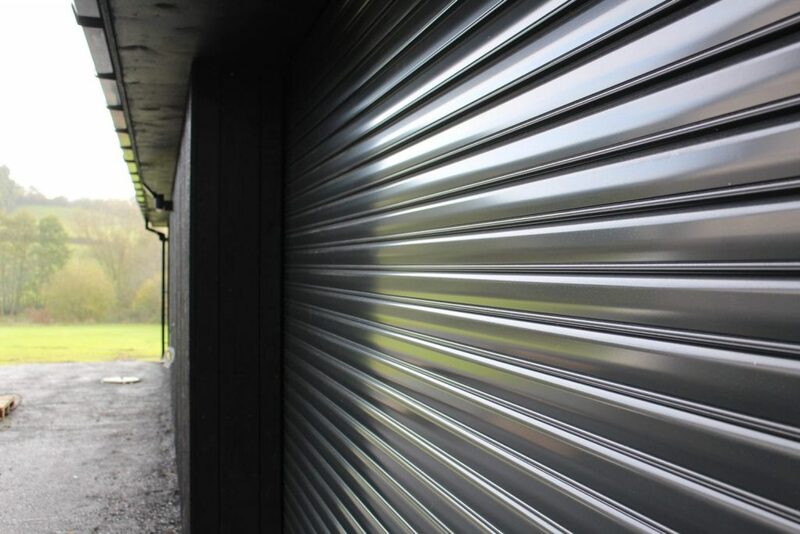 The LockDown system ensures security cannot be compromised by incomplete closure, and also completely removes the need for unsightly ground bolts. Finishes are offered in a wide range of polyester powder coat colours or anodising to provide an aesthetic shutter that does not detract from the property. Likewise, the shutter curtain style is designed to suit the domestic environment. Our garage doors can be controlled via simple pushbutton or key switch, or integrated into a building management system, or independent remote control. Roller garage doors are a lot more aesthetic than a sectional garage door or side hinged doors due to the minimal space they take up when they are opened, and the way they can be integrated into the building. As part of a major building refurbishment, a luxury residential property in Beaconsfield now benefits from a new garage protected by Equilux High Security Garage Doors. The extensive garage was built to house a number of expensive vehicles and leisure equipment and, as a result, required a significant level of round the clock security. Charter Global were able to supply the protection required due to the unique design that enables the garage security door mechanics to be integrated into the actual fabric of the building, making the door far less prone to attack. The lintels and cavity closer guides were installed by the builder as the garage construction progressed, with the security shutter itself installed by Charter Global’s qualified engineers. The design of the our garage door system has also allowed for maximum use of the available room in the garage as the shutter is housed within a structural lintel and therefore takes up no usable space. A further matching shutter on a personnel door has also been installed, removing the need for a traditional swing door. A key consideration of the security garage build was to ensure the security shutter complemented the traditional design of the property. A timber finish was selected from a wide range of options, with the side guides finished in an alternate colour. The completed installation now provides the owners with a high level of garage security without compromising the design of the property. This particular client required high security garage doors to secure outbuildings on the estate from intruders. The outbuildings contained expensive equipment used by the estate management team as well as vehicles owned by the client. The building would be occupied sporadically throughout the year – therefore it was important to make sure it was secure when empty and unoccupied. The Equilux Garage Door was specified to each garage opening and the Equilux Built-In Shutter system to the window in the estate manager’s office. Security was a very important part of the consideration, and it was vital that the security solution did not affect the design of the building. 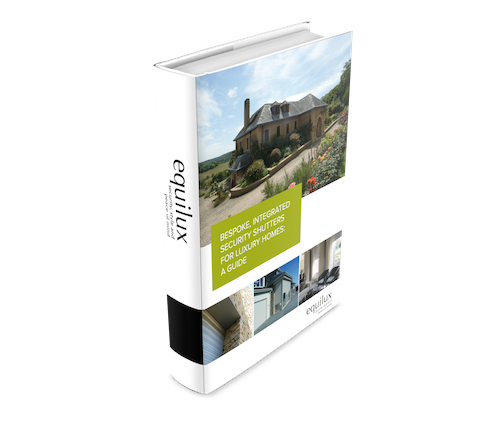 For more information on how Equilux can help install high security garage doors or anything other domestic security shutters, why not take a look at our free guide? Click on the below icon to download your copy. Alternatively, give us a call on: 0845 050 8705 or send us a message via the contact page.